Discussion in 'Transformers Feedback & Reviews' started by Razerwire, Jan 10, 2008. Picked him up today. Love him. Love the colors. Love the new head sculpt and useable hands. Absolutely love the lifeboat gun. Wished the automorph feature was more fine tuned than Blackout, as well as how the shoulders are attached with those two fragile little plastic tabs. Now do an official gallery of him for the site. Don't you have him? Aren't you supposed to be taking pics? Why did I even have to take these pics? Colors are sharp, and it's what is hands-down my second-favorite helicopter Transformer ever. I'll be passing on Evac...and most of the other movie repaints. although he is a repaint, and i don't collect them if i have the original mold, there are three reasons why i need him! 3) i need more autobots for my collection!! Arcee and the Real Gear Autobots would like to have a talk with you. 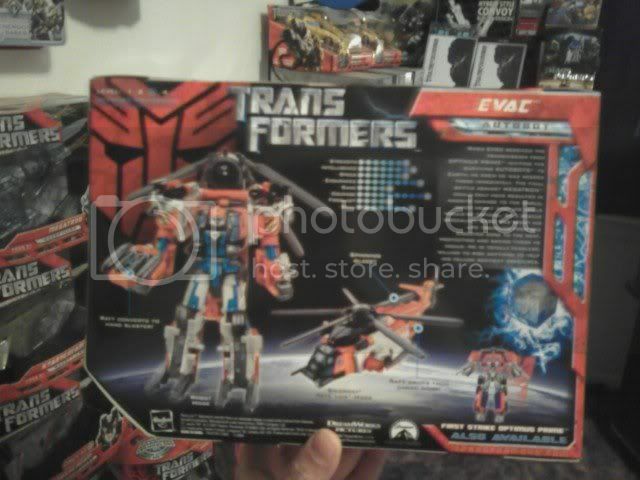 As for Evac, I might get him, though probably not. It'll come down to an in-person decision. Definitely passing on this one. Unfortunate that they haven't tuned up the automorph. How does he compare to Cybertron Evac in terms of looks, transformation, articulation, and overall appeal? I love CYB Evac a LOT. So it's not even a fair comparison. This Evac is cool. But doesn't hold a candle to CYB Evac. Awesome! Looks like a totally different toy than Blackout with that deco. Jarodimus picked one of these bad boys up for me, and I have to say, I like it better than Blackout. It doesn't seem to have the Automorph hangup that the first version of the mold has. And the raft/blaster is just pure brilliance. The only hangup is that the tent of the raft falls off of the base of the raft very easily. I don't know if it's supposed to do that, or if this is on the same line as all of the other gluing errors. As I was trying to remove the raft from the package, the tent popped off. It goes back in fine, but I thought I had broken it. I like this color scheme for Evac. I'm glad they did a slight remold for the head and the hands. I wonder if anyone is going to repaint a mini Scorponok for him? It doesn't seem to have the Automorph hangup that the first version of the mold has. Good to hear. Mine worked perfectly, too -- noggin flipped around there just like it was s'posed to. Same here. Hasn't fallen off again, though. 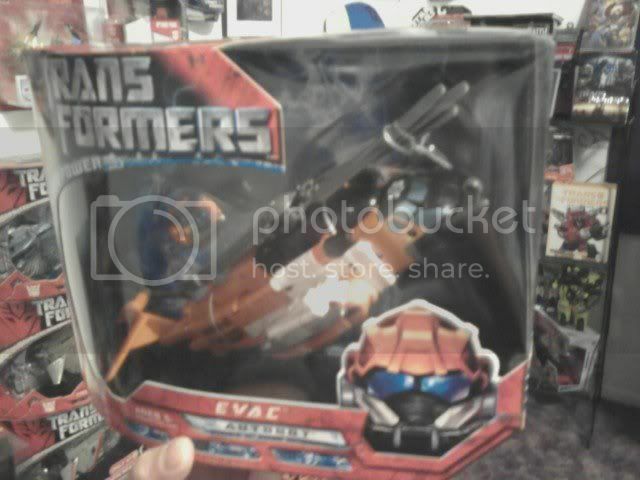 Plus, Evac's a TF medic-type, which always makes me happy. We also have a feedback thread here if you wanna leave some comments on the fig.